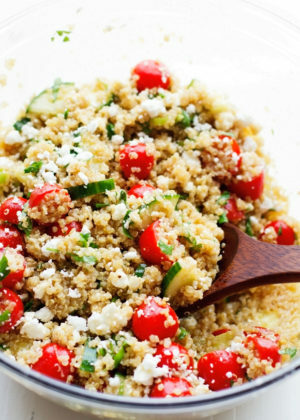 Similar to tabbouleh but made with quinoa, this summer tomato and cucumber quinoa salad is perfection! The salad dressing is light and refreshing. Loaded with feta cheese and fresh parsley, this salad makes a great side to any main course! Quick and refreshing! <– The epitome of a good salad — AmIRight? Summery salads is what summer is ALL about. But really. I just loving using up fresh tomatoes and cucumbers in the summertime. And quinoa is just a great addition to salads when you’re serving it alongside a bit of salmon or chicken . Trust me. It’ll make one power packed meal that will keep you full of hours. Tomatoes – check. Cucumbers – check. Tantalizing pomegranate molasses and honey dressing – check. Oh and lots of FETA, FETA, FETA – check, check, and check! This cucumber quinoa salad would probably be a sister to the middle eastern tabbouleh. 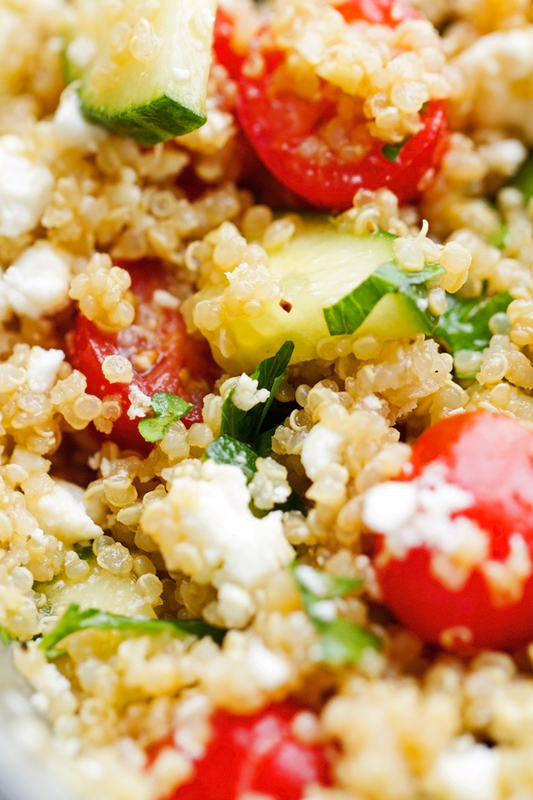 We’re using quinoa instead of bulgur, flavoring our dressing with things like honey, and adding tons of salty feta to really make this a complete flavor experience. Dare I say, I maybe, sorta, kinda, like this salad a little more than traditional tabbouleh. This is for all my friends out there that love nontraditional salads. This salad has none of those traditional salad bases like baby spinach or romaine lettuce! How about the dressing? It’s completely homemade. We’re not using those store-bought dressing that are loaded with who knows what. All the ingredients are simple and straight forward, except for one. The only one that you may or may not have heard of is the pomegranate molasses . It’s an ingredients thats often used in Middle Eastern cooking and you see it in a lot of stews and what not. Simply put, it’s pomegranate juice that has been reduced with a bit of lemon juice and sugar. I purchased mine from my middle eastern specialty store (Phoenicia for my Houstonians out there). If you can’t find it, I suggest ordering it online. It really adds a ton of flavor to not only this dressing but also to marinades, drinks and stews! The rest of the ingredients, as promised are simple – honey, olive oil, lemon juice, garlic, and a good pinch of salt and pepper. The pomegranate molasses and honey dressing really pair well with the sweet and tart cherry tomatoes in this cucumber quinoa salad. Throw that feta into the mix and you’ve gotta match made in heaven! The fruity flavor of the dressing leaves this salad with a sweet, zesty, salty, well rounded flavor. Plus it takes like 3 seconds to whip up. <– I’m lovin’ it! Do yourself a favor. 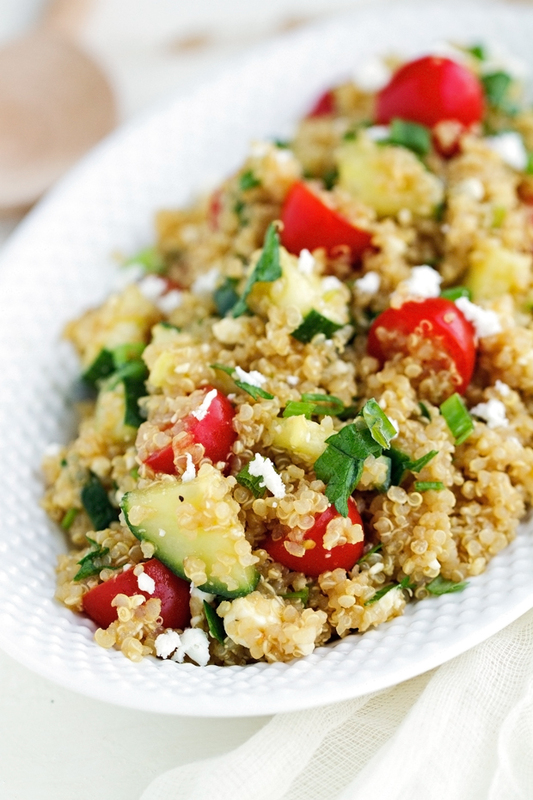 The next time you have extra quinoa leftover, use it in this tomato and cucumber quinoa salad. It’s the perfect way to turn it into something completely new. And the best part is that it’s completely vegetarian friendly! And filling I might add. It’s rare that I find a salad to be filling that doesn’t contain any protein from meat or beans. I had this on it’s own without a protein for lunch and it held me over easy for at least 3-4 hours. Also, it’s man-approved because the hubby (hater of all raw tomatoes) ate it without a complaint. Granted he did have a little protein on the side but all in all he did say he enjoyed it! 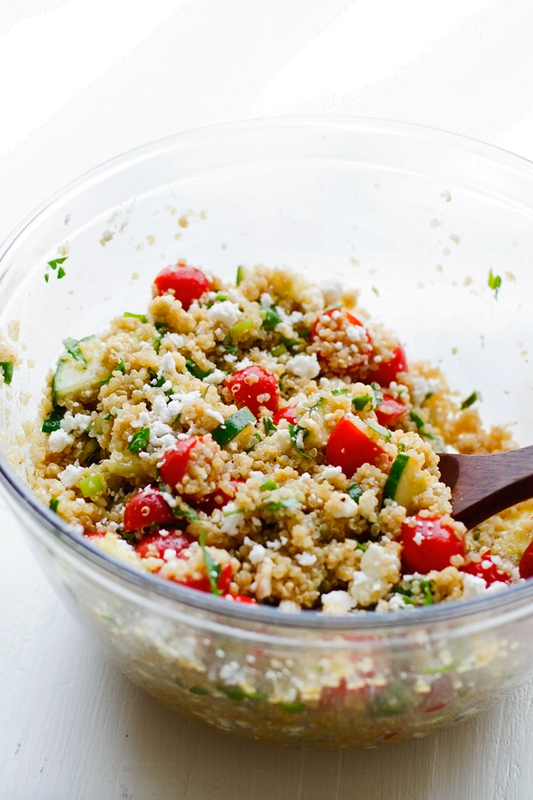 Also, the dressing on this quinoa salad can easily be made ahead of time and stored. And you can use it on leafy green salads as well! DRESSING: Combine the lemon juice, garlic, honey, pomegranate molasses, and a pinch of salt and pepper in a small bowl. Whisk in the olive oil until the dressing is combined. Check for seasonings and adjust as desired. 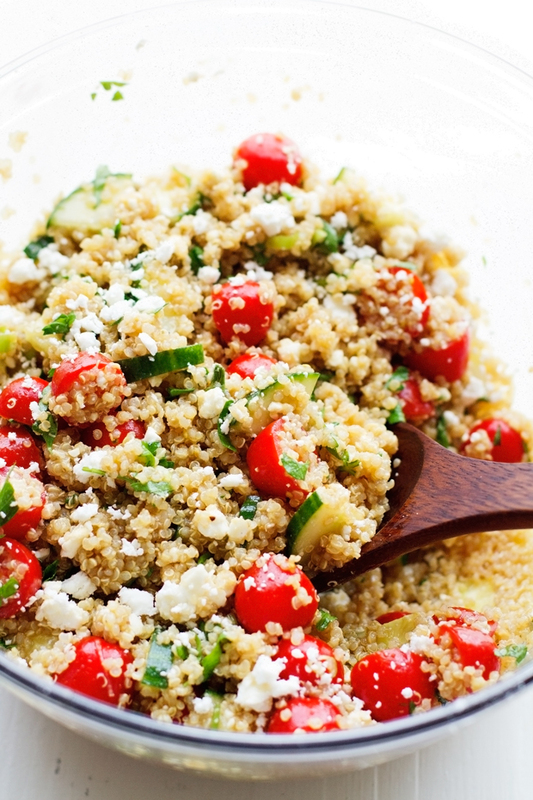 SALAD: In a large bowl, toss together the quinoa, cucumber slices, tomatoes, parsley, and crumbled feta. Add the dressing when ready to serve and toss to combine. If you would like to prepare the salad in advance: Keep the salad component and the dressing separate until you are ready to serve.